Hello, Android lovers. We’ve got a little surprise for you. 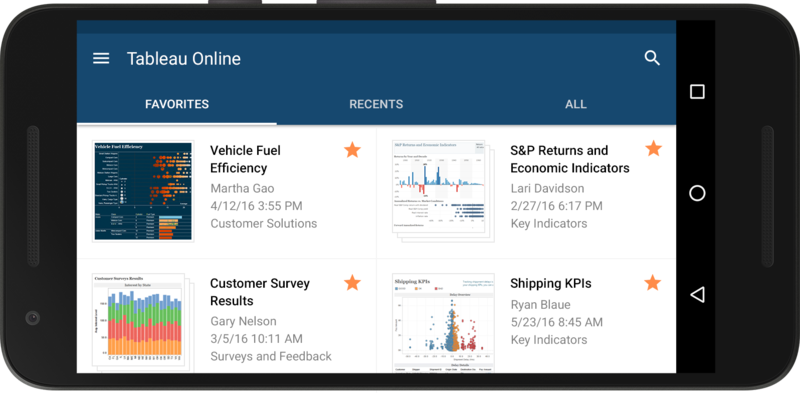 We are excited to announce Tableau Mobile for Android phones is available right now! Download it today. We know you’ve been jealous seeing Tableau Mobile running on your friend’s iPhone. You can put your jealousy to bed. The wait for the Android version is finally over. Easy access to your data: The app provides a friction-free and secure login experience. Your data is always displayed front and center. Enjoy browsing your vizzes with fluid infinite scroll with your Tableau Sever content, loading paged thumbnails in real-time. Location awareness: Have you ever wondered what's going on around you when you’re out and about? The Android app allows you to center the map on your current location with single tap and ask questions like: Which customers are within 3 miles of where I am? Backward compatibility: The app is compatible with Tableau Server 8.2 and above as well as with Tableau Online. You need to be running at least Android 4.4 (KitKat) on your phone. Some capabilities like offline snapshots, background refresh, and Kerberos authentication will come after this initial release. We look forward to hearing your feedback and suggestions on the Ideas Forum. May the force be with you. how do I use this app? I installed it on my phone; provided the server name url of my organization and nothing happens when I click on Connect. A message at the bottom of the app says "Cannot connect to server." Are there any other steps I need to take to make it work? What/where are the precise install instructions? I want to use this app asap. Please help! The mobile app only connects to a Tableau server that you have access to. It's for interacting with data you've already created in Tableau Desktop, and then uploaded to Tableau Server. You could try to see if there are public Tableau Server addresses available to connect to the mobile app but I don't know if there are. Start with Tableau Desktop on your PC. I do have access to the Tableau Server that I use in my organization. Yes, I'm trying to access dashboards that I've created in Tableau Desktop and have published to the server. How do I use my Android phone app to access these dashboard? What do I need to do to my phone to make this work after I've downloaded the app? Hi Bruce. Is your Tableau Server exposed to Internet? If not, you can access it only when you're at work, connectiong your smartphone to your organization's LAN. Bruce, were you able to connect to the Tableau server from the app? I have the same problem connecting to the server from the mobile app(in Android and iPAD). I can successfully connect via the brower in mobile and app. Is there any configuration setting to be done for this to work through mobile too? If anyone on this forum has an idea how to set this up, we would be grateful. Sweet, is Linux Server support something I can dream about? I am able to connect to Tableau Mobile on my iPhone 6 but users with Android are unable to connect. When they type in the URL they are met by a white box with an indicator that just spins and finally bombs out. Has anyone else run into this? I have the same issue, and still no answer.